Chances are you’ve covered your pool by now and are already counting down the days until you can uncover it! While the pool is covered, it should not be forgotten when it’s not in use. You need to pay attention to what’s going on with your cover especially during the winter to maintain your pool and to avoid any accidents. If you notice any leaves or twigs on the cover, remove them promptly so they don’t poke a hole in the cover. Also try to blow off any leaves with a leaf blower when you can so they don’t weigh heavily on the cover, especially if it rains. 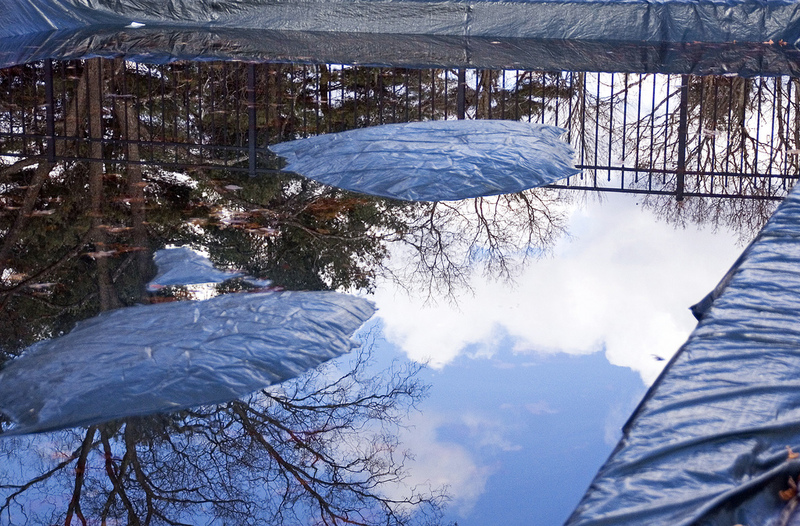 The excess weight of heavy snow in the winter can cause damage to your cover and your pool. A roof rake is the best way to gently pull snow off your pool cover. It’s best to clean the snow when it’s fresh so that it doesn’t freeze up. You may notice holes in your cover no matter how hard you try to keep it clean. If you do, use a safety cover patch to cover the spot as soon as you can. This will prevent any debris from falling into the pool while preventing the hole from getting any bigger. Check the straps of your cover to make sure they have even tension all the way around to keep the cover tight. You want to make sure no gaps surface so that no animals or children fall in accidentally. It’s a good idea to mark where the edges of the pool cover are with lawn stakes connected by twine or rope. If you live in an area where there is a lot of snow, it may look like everything is part of the lawn, opening the door to potential accidents like someone stumbling onto the cover. Besides taking care of your pool cover, another way to keep the area safe around your pool is to install a pool fence. This will give you added protection and peace of mind that you are doing everything you can to keep your pool area and any visitors safe. Adding a pool fence around your pool can help prevent drownings and other accidents. For information on pool fences, contact Protect-A-Child Pool Fence at 1-800-992-2206.